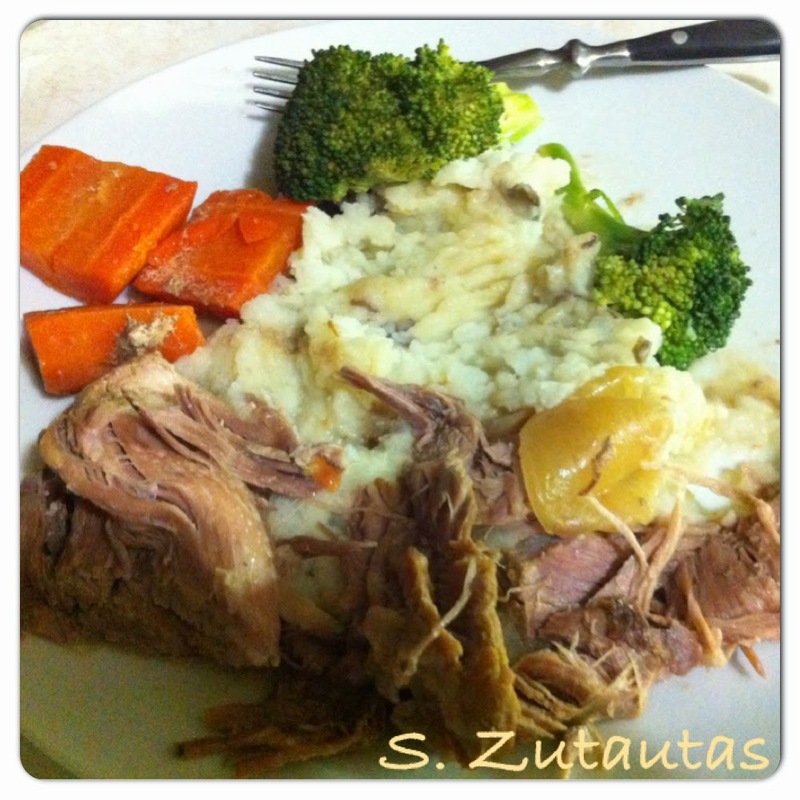 Inexpensive, easy, delicious pork roast meal, complete with veggies and a side dish of mashed potatoes. When cooking in my crock pot I usually start by spraying it with cooking oil to make clean up easier. In the bottom of the crock add one of the carrots, and then place on top of them the pork shoulder. Add the rest of the carrots along with the onion placing them around the pork. In a measuring cup or bowl mix and whisk the cream of chicken soup together with the water, and pour over the pork. Place the cover on the crock pot, set the temperature on low, and cook for 6-8 hours. When you are ready to eat remove the pork roast that will more than like fall into several pieces. Remove the carrots and onions placing them either in a bowl on onto serving plates. Before the pork was ready I made mashed potatoes and steamed broccoli. On each plate I spooned out the mashed potatoes making a well. I then spooned a bit of the soup mixture onto the potatoes. Normally I wouldn't do this but the pork shoulder I used had very little fat on it. The soup mixture made the perfect gravy. Do you use your crock-pot or slow cooker very often? I've had a crock-pot since I was 18 and still have my original one that I'm saving for one of my sons. I have since bought a new one because the crock was not removable making it a little more difficult to clean. This is what I'm cooking for dinner tonight! It's been in the crock pot since early morning and the house smells wonderful. I like to pan sear my pork roast before placing it in the crock pot. The leftovers make great pulled pork sandwiches or burritos.